The first bike share program in the world was the White Bicycle Plan, the brainchild of the Dutch anarchist group Provo. White-painted bicycles were placed at locations around Amsterdam in 1965, intended to be used for a single trip and left behind for others to use. Within a month, the bikes were gone, either stolen or chucked into the city’s canals. Other free bike systems were tried in France and the U.K. over the next few decades, with varying degrees of success. The first important “second-generation” bike system was implemented in 1995 in Copenhagen, Denmark. The city’s ByCyklen program, which continues today, required a refundable deposit to unlock its bikes from their stations. Three years later, the first “third-generation” system was introduced in Rennes, France in 1998. Sponsored by Clear Channel, the program utilized a smart card to access the bikes electronically. 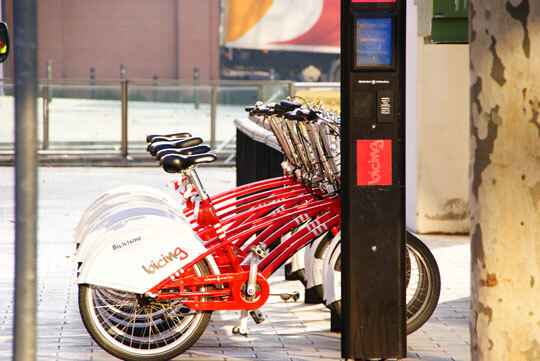 Bike share systems are in use in more than 500 cities worldwide, with Africa the only continent without one. Western Europe and China boast the most successful and widespread programs in the world. Bicycle Coalition of Greater Philadelphia executive director Alex Doty points out that the most robust bike sharing systems in Europe are not in the cities that immediately spring to mind when one thinks of cycling-friendly locales. As for the United States, a number of cities have implemented bike share programs in recent years. The University of California, Irvine implemented a campus-based system in 2009, while Denver became the first city to utilize a third-generation smart-card system in 2010. Programs in the States have largely been concentrated in major urban centers, the most recent being New York City’s controversial Citi Bike, inaugurated in May 2013.